I don't suppose that he's predefined. Just a sim. Still no grouch today, either. It's just frustrating. Agree But I guess it's because there are only one toaster and microwave. The BBQ is pretty useless for the restaurant, as it only shows the usual BBQ tasks. I cannot wait to build my restaurant but I don't want to take my Simoleons down below one million, so I need to wait! I'm not too happy with all of the Simoleons you need to spend on this, I think it could have been a bit lower. I have to spend 350,000 to build it first go off, some people say theirs costs them only 300,000.....why is that? I have all community buildings except the car dealership and I have most house plots taken up with a few to spare. It took 4.5 hours rather than 5 minutes for my Sim to investigate what was on the ground that the Grouch left. Can a senior do any repair work on the restaurant? Some of my sims are getting near retirement and I wondered if they can still help out? DollyMixture wrote: Can a senior do any repair work on the restaurant? Some of my sims are getting near retirement and I wondered if they can still help out? Yes, I used seniors to help with the repairs. 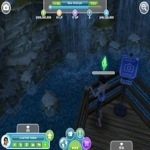 LovemySims wrote: I cannot wait to build my restaurant but I don't want to take my Simoleons down below one million, so I need to wait! I just re-checked and the estimated 2 days and 18 h and 350 000 simoleons requirements to build the restaurant is a sample time/price in a town where all the community places have been built. (I just corrected this on my post. From 300 000 to 350 000. Apologies if it was misleading). As far as we know, price and time requirements depend entirely on the size of your town, i.e. how many community places you have. But no idea if built house plots count for the cost of a new venue like the restaurant. I completely agree building costs of the Candlelit Fork could have been lower! Level 54.Town with Bistro, Spa, Daycare & Culture Centres. Island with all venues inc. Xmas House, Latin Villa & Castle.